Information: Legendary origins: Noah's ark landed in the mountains of Ararat in far eastern Anatolia. 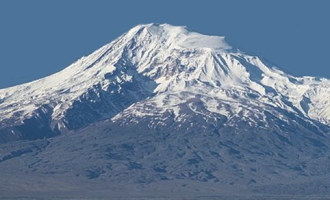 One of Noah's descendants, named Haik, founded the nation of Hayastan (Armenia). Some Armenians migrated north to become the Angles, Franks, Germans, Goths, Jutes, and Saxons, according to Yacoubian's Armenian-English dictionary. Yacoubian supports this claim with a list of European towns called Erman or Herman. The Armenian king Apkar sent for Jesus to heal his leprosy, but Jesus, otherwise occupied, sent the apostle Thaddeus who healed Apkar and then baptized the king and his court. Armenia thus became the first Christian nation and the oldest Christian church. The Armenian language derives from an Indo-European prototype, linking it to such languages as Kurdish, Urdu, and Persian.